Posted April 5, 2019: Regrettably, Daffodil Hill is closed for the season. It is a great time to visit Sutter Creek though. Below are some of the upcoming events for April. Like to shop? We’ve got some of the finest shops in Amador County! Hungry? Visit our restaurant page … homey and world class. Daffodil Hill – A Sutter Creek Special Event! Daffodil Hill normally opens between mid-March and mid-April. » Check facebook for updates. » MAP & DIRECTIONS below (scroll down). » Stay, shop, dine and play in Sutter Creek. Each spring Daffodil Hill explodes with thousands of blooms, attracting visitors from around the world. 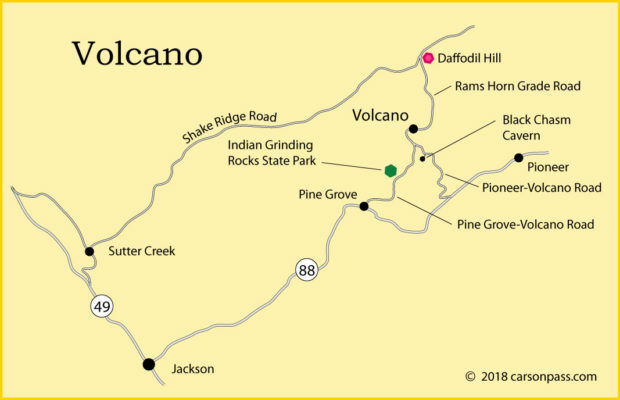 Daffodil Hill is located at 18310 Rams Horn Grade, Volcano, California. Daffodil Hill is open Monday through Sunday, from 10 a.m. to 4 p.m., weather permitting. Admission and parking are free, the only charges may be from local youth groups raising funds in concession stands across the road. HANDICAP ACCESS is limited, but still enjoyable with wonderful views. Parking areas and pathways are gravel and dirt with some steep inclines. Use caution with wheelchairs and motorized chairs … and have people with you for stabilization. Handicapped parking available. Daffodil Hill is a ranch owned by the McLaughlin family since 1887, and is located at 18310 Rams Horn Grade, Volcano, CA 95689. 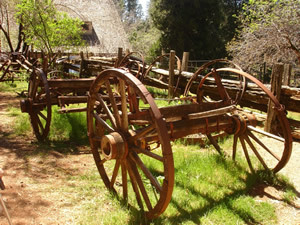 In the early days of the Gold Rush, Daffodil Hill was a regular stopping place for teamsters hauling timber from the Sierras down to the Kennedy and Argonaut Mines, and for eastbound travelers heading for the Comstock Lode on the Amador-Nevada Wagon Road (Highway 88). In 1877, after coming west from New York and Ohio, Arthur McLaughlin and his wife, “Lizzie” van Vorst-McLaughlin purchased the ranch from Dutchman Pete Denzer, who planted a few daffodils around his residence in remembrance of his home country of Holland. Arthur and Lizzie continued to plant additional daffodils to beautify the ranch. 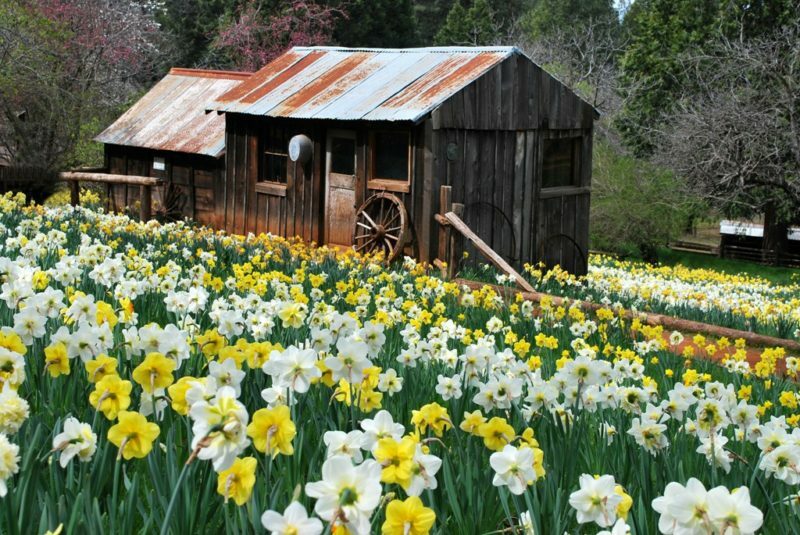 Daffodil Hill is situated in a beautiful mountain setting at the 3,000 foot elevation in Amador County. 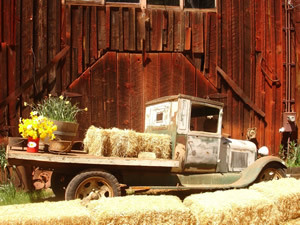 With pine trees, the original 1880’s barn, wagon wheels, gold rush era mining equipment and antique farming implements, it appeals to anyone with a love of nature and history. Flowers are everywhere and peacocks, chickens, miniature donkeys (Rosie and Sunshine), and a horse (Hannah) are also there for young and old alike to enjoy. Today, much of the landscape around the old homestead is covered with several varieties of daffodils. The McLaughlin’s descendants have continued to personally plant several thousand new bulbs a year. In the past several years an average of 16,000 daffodil bulbs per year have been planted by the Ryan brothers and their families, great grandchildren, great-great grandchildren, and great-great-great grandchildren of Arthur and Lizzie. It is estimated that today, Daffodil Hill is carpeted with approximately 300,000 bulbs when in full bloom. Daffodil Hill is open only in the spring, usually from mid-March through the first weeks of April. After that it goes back to a working ranch and is not open for visitors. Mother Nature determines the length of the blooming season each year. Daffodil Hill is not open during or immediately after inclement weather. 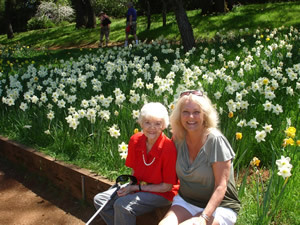 Visitors are advised to call Daffodil Hill (209) 296-7048, before they visit to make sure it is open. 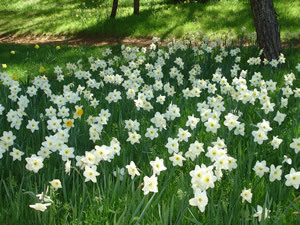 Daffodil Hill is open seven days a week during the season from 10:00 AM to 4:00 PM, weather permitting. Admission and parking are free, although donations are gratefully accepted. McLaughlin’s Daffodil Hill is a family operated and funded operation and any donations help fund new bulbs for the following year. The family requests all visitors stay on the paths at all times and do not enter the planting areas or pick the blooms. In an effort to preserve the tranquility of Daffodil Hill, no pets are allowed on the main grounds. Daffodil Hill can be reached from Sutter Creek and the trip is about twelve miles. From Main Street Sutter Creek (Old Highway 49), turn East on Gopher Flat Road. Drive approximately 3 miles, and turn left at the third stop sign, which is Shake Ridge Road. Drive about 9 miles on Shake Ridge Road to Rams Horn Grade. Parking is to the left.